In this section, you will learn how to animate multiple prims, smoothly and realistically. In this example, we are going to use 3 scripts total. One of those scripts you have already loaded in the fins. The next script will learn the movements we teach the whale. We will save those motions in a notecard. The third script will play back those movements. The only script we will end up with needing is the the one that plays back the motion, and the notecard. This must be the last step you do when making a whale, or any other animal, robot, or movable thingamabob. You will not be able to unlink and re-link the whale after you have finished teaching the script to play back motion. The scripts will remember each prim by number. Re-linking the prims in a different order will lead to a real mess! Trust me, I know. Copy the following script into the root prim. Name it "Prim Learning script". You will also need a notecard in your root prim. Name this notecard to "Movement". An empty note card is all you need. // Put this script in the root prim. Put the child script in all prims you wish to move. // Reset - wipe out all recording. There are several subroutines needed. The following two will strip any extra white space to the left or right of data read from a note card. DumpBack() will print the coordinates to chat. You must copy and past the chat into a notecard because Second Life cannot write a notecard. 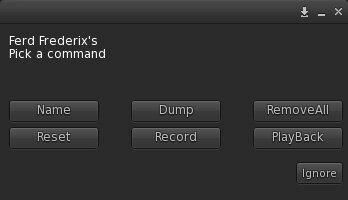 MakeMenu() builds the dialog ox menu system. Any named animations will be added to the menu so you can click them and preview them. The default event is called when the script resets. Experts may notice that this script does not have an llResetScript() in it when it is rezzed. This allows you to use this script for playback and creation of notecards. Instead, we re-establish the dialog channel listener, which is shut off when stored in inventory. Each time the server reads a line from the notecard, it will fire the event 'dataserver'. The line was delimited in the note card with the pipe "|" character. The llParseString2List() system call is used to make a list from the data. This makes it simple to pick each parameter out of the list with llList2String(). I also call the subroutine Getline() to strip out the white space and covert what is left into integers or floats. A blank line will have prim num of undef. If there is a linked prim num, there may be a sound to play or text to chat. I then add the items read from the notecard onto the play list. The last part is to actually animate the prim that we have read. The new command llSetLinkPrimitiveParamsFast does the rotation and movement all at once (well almost), with no delays. When you touch the dialog box entry, or type text into chat, then the listen() event is fired. Each of these if statements will handle a different button. llOwnerSay("Position all child  prims, then select the Menu item 'Record'. Messages from other scripts are sent to the animator by llMessageLinked. If a message is sent on the 'playchannel', the script will animate the listed animation. A simple script , such as a person sensor, collision detector, or other trigger can then play back any recorded animation. The other possibility is that you are teaching the script new movements. Messages that arrive on the 'linkchannel' are stored in the master animation list. Clicking 'Record' will set off a flurry of Link Messages. This timer captures the number of expected messages and displays the total as they arrive. Dump - print all animations to chat. You will need to copy and paste this into the note card "Movement"
The first thing you must do is to click 'Reset'. This step makes the script forget any values it may have read at start-up. This will wipe out any RAM-based note card data. The note card will still be inside our object and it will not be erased. Click the 'Name' button. The system will respond with "Type the current animation name on channel /601" or some other random channel number. Type in main chat the words '/60x up'. This will name the first animation. Now you can edit your whale and position the flukes, tail, and fins to the 'up' position. Position all child prims, then select the Menu item 'Record'. You can repeat this step to move our fins in small increments, or just move them once, insert a pause, and so on. When finished, click 'PlayBack' to play back the animation. The whale script needs two animations, 'up', and 'down'. Click the Name button again, type in /60X down', and move the whale tail and prims for the tail down position. Click Record. You can play back the 'down' animation and the up animation by clicking the new buttons that appear in the menu. If you make a mistake, just click Reset, and start over. Once you are satisfied with the up and down positions, click 'Dump'. A long list of our edits will be printed into chat. You must copy this chat and paste it into the movement notecard. You can reset the script and watch it load the notecard. each part of the fish will move and rotate into position. This will happen slowly because of the very slow way that Second Life reads note cards. Once it has loaded, you can click the whale, click 'Name' and name an animation ('up' or 'down'), then click Playback to watch it move. You can make the whale speak and play sounds by adding the text or sound UUID to the notecard. To add chatted text, add a pipe and text like this: |text|| to the end of any line. When the script runs that line of animation, it will chat the word 'text' into main chat. You can change the next script to chat this command into a private channel, and control objects, such as a bridge that can raise, or a boat that can toot when the whale passed by the boat. When you are totally satisfied with the whale flippers, click 'RemoveAll' to finish and shut down all child scripts. You can also delete the Prim Learning script.